Toronto is Canada's business capital and largest city, acentre for Anglo-Canadian culture, it's also one of the great ethnic melting pots of the world. Is a clean, safe and vibrant metropolis where real estate prices are high and blood pressure levels are low. Toronto isn't a city with a checklist full of attractions, although the famous Niagara Falls are nearby. It's a city that grows on you slowly. Its summer festivals, the spicy corners of its markets, the beachfront boardwalks and the music pouring out of its neighbourhood eateries are really nice. It's a place just finding its feet, and is all the more charming for it, fresher than many a city its size. The city no longer carries the heavy, moralistic mantle of 'Toronto the Good'; its many immigrants have helped the city shake its traditionally standoffish image. Telephone Area Code: There are a number of different area codes, each integrated into the phone number. Until around 1720 Seneca Indians lived in the Toronto area, when the French established a fur trading post and mission in what's now the western end of the city. In 1793 the French eventually succumbed to the British, who made Toronto the capital of Upper Canada and renamed the burgeoning village York to help make them feel more at home. The inhospitable muckiness of the land gave rise to its notorious nickname 'Muddy York'. In the War of 1812, the Americans held York for six days, looting and razing the town. Somewhat miffed, the British struck back by heading to Washington and torching what is now known as the White House cause it was painted white to hide the burn marks. At the war's end, York began to expand and the town's inaugural mayor saw to it that York went back to being a native Indian name meaning 'meeting place', Toronto. 1824: however, all was not well. Firebrand William Lyon Mackenzie rebelled against the strong political influence Toronto's powerful families exercised, staging the shortest-lived rebellion in Canadian history. As a result he went into exile, while unluckier rebels hanged. George Brown became a key political figure in Mackenzie's absence, forging a new liberal party and driving the confederation of Canada in 1867. Throughout the Victorian era of the late 1800s there was seemingly nothing but progress for Toronto, with impressive buildings going up, a steadily increasing population and the arrival of the first European immigrants. 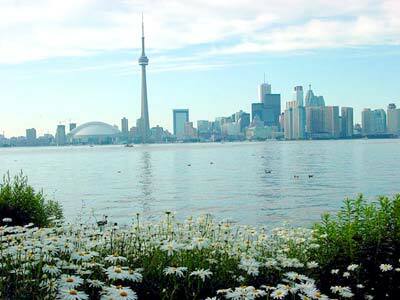 Although Toronto was still in Montréal's shadow, it became more prominent as capital of the newly named Ontario. 1904: a good portion of the inner city went up in smoke, levelling more than a hundred buildings. During this time the city became known as 'Toronto the Good' for its straight, laced, highly moral, mannered culture, a tag that only an the 1970s began to fade. 1920: the city was booming, but during the Depression everything stopped short. Anti-immigrant hostilities ran high, with anti-Semitic riots, the banning of all Chinese immigration and racism against blacks, all the more lamentable considering Ontario's role in the Underground Railroad, which brought slaves to freedom in Canada. In the period following WWII new immigrants began to flood in, bringing with them new cultures and livening up the staid city. 1980: Toronto became one of the fastest-growing cities in North America, with the city's optimism continuing right through the boom times of the 80s and going in recession in the early 90s. 1998: when five surrounding suburbs were incorporated into its environs, Toronto became the largest city in Canada and the fourth-largest in North America. New condos edge out affordable housing, new subway lines are built that seem to go nowhere particularly useful and historic structures have come under the wrecking ball. Nevertheless, the city has certainly come a long way from its beginnings as Muddy York, the second-place prize after Niagara. Toronto has largely recovered from its economic malaise, thanks in part to continued infusions of immigrants. Some of the upswing was also caused by a pro-development City Hall - which unfortunately produced some nasty side effects in the form of increased homelessness and environmental neglect.